If you are managing an information-only website, you will have a harder time defining the value of a visit compared to if you were running an e-commerce website, for example. As such, it can be difficult to figure out just how your site, and your users, benefit from you putting a lot of effort into search engine optimization. Here are four things to keep in mind when applying SEO to make your website convey information more efficiently. In regards to SEO of information-only websites, for instance in the public sector, time is the currency in which we measure our success. Search engine optimization can be used to free hands from doing menial tasks, which should be automated or done by the users on a self-service website. One of these tasks is helping visitors locate specific information on your site. Searching for answers on an information-heavy website is often like looking for a needle in a haystack. Using a search engine to find the information will make the task easier, but this requires that the information is search engine-friendly. In other words, it is easier to find the needle if you have a magnet - but only if the needle is magnetic! If users can't find the information they need on your website, they will call or show up in person, taking up valuable employee time. These are avoidable contacts which can usually be handled through a much cheaper communications channel. With SEO you can pick some low-hanging fruit, because it is relatively cheap and easy to get started with, compared to optimizing complex self-service solutions or business processes. The only thing you need to do is rewrite and add information on the website. There is the direct win mentioned above regarding the avoided contact, but there is also an indirect win for you in the fact that your users' trust in your website will increase if the are able to complete the task they came to do. This in turn will make your visitors keep using your site for future request, which saves you time and money in the long run. If you have an information-only website, chances are you also have a customer service, citizen service, or some other kind of support function which handles the contacts from users, who weren't able to find what they were looking for. These functions are where you'll find the hidden gold. Every day users tell your contact function exactly what they expect to get from you and this is the information you want on your website. So to get started, just ask your contact function what users are asking them. Be careful how you ask though, because the persons who have the information you need are the same persons you are trying to free up to do other tasks, so sometimes there is a conflict of interests. One last but important thing, when you are writing your headers, your meta-descriptions, etc. make sure you speak the user's language. Your efforts are in vain if you are talking about a 'digging device' and your users call it a 'shovel'. When you have found out what information to have and to highlight on your website, you just have to get it on there in a search engine friendly format. 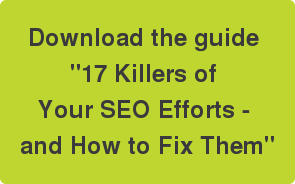 To get started, you can download the guide '17 Killers of Your SEO Efforts - and How to Fix Them'.